A great weekend – and £800 raised for charities – at the Classic Motor Show. attracted lots of attention. The cars on display ranged from a 1956 300SL Gullwing through representatives from each decade up to the 1990s. The Gullwing and an ex-George Harrison 500SEL AMG were put to good use in raising money for charity in exchange for photo opportunities. Further funds were raised as a result of a visit to the stand by antiques expert David Harper. Well known for his appearances on television's Antiques Road Trip and Flog It!, David is also an accomplished artist and generously donated some greeting cards produced from his paintings for the Club to sell in aid of charity. A total of nearly £800 was collected for the RNLI and the Huntingtons Disease Association. 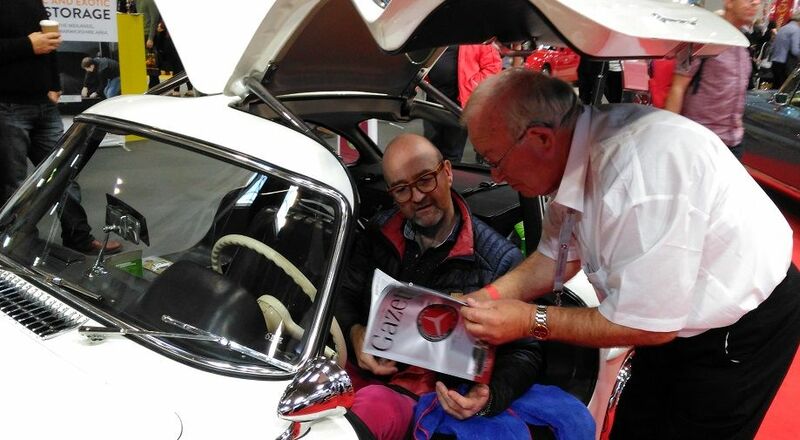 Many Club Members, who were able to buy reduced price tickets for this huge annual event at the NEC, enjoyed relaxing with free hot drinks and biscuits in the Members' Café on the Club stand – around 1,200 took advantage of this. The Club Shop was on hand as was a strong Technical Team – who were kept busy all weekend answering Members' queries. 151 new Members joined the Club at this event and all received a valuable Meguiar's car cleaning kit as a welcome gift. produced entirely at the Club's own expense. It is the only UK club recognised by Mercedes-Benz UK Ltd and Daimler AG. Mercedes-Benz cars of all ages. It publishes a monthly, full colour, 80-plus page, A4 magazine. discounts from appointed Mercedes-Benz dealers, hotel groups, ferry operators and car accessory suppliers. The Club also has a scheme to offer its Members tuition from the Institute of Advanced Motorists. Annual subscriptions start from just £35 per year if paid by direct debit.